Once again stretching the bounds of Thrifty Vinyl credulity, I present this Lp, as thrifted by my father some 35 years ago in Mount Vernon, Ohio. In fact, there were something like 10 or 15 copies of the record in that haul; I’m pretty sure he’s got several of this micropressing left. First of all it is a product of Kenyon College, in particular, members of its weekly, student-run newspaper, The Kenyon Collegian. It consists of gentle satire at the expense of the College, my alma mater, and its environs. Kenyon, along with a few other colleges in central Ohio, represents a sometimes uneasy clash of civilisations: interloping/East Coast/monied/snobby v. local/Midwest/working class/narrow-minded. 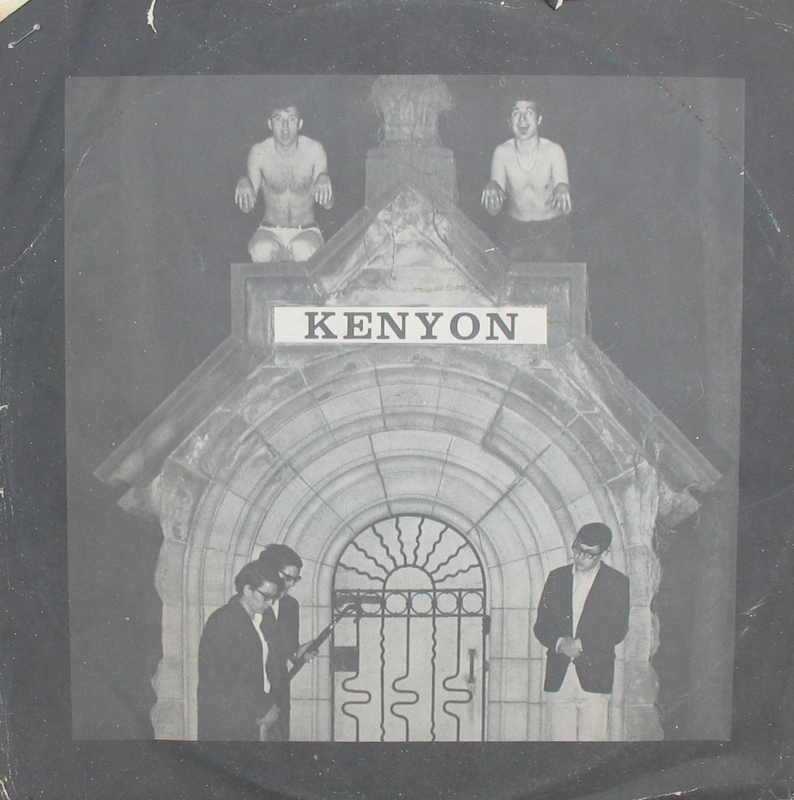 So, for example, my grandfather refused to display the transparent Kenyon College bumper sticker I gave him on the back window of his Fuego on the grounds he’d likely be targeted by local law enforcement (it was tacked up on my grandparents’ cork bulletin board in their kitchen). Whether or not this is true is beside the point; my grandfather believed it and, no doubt, others did too. As both “townie” and “college boy” I pretty much found myself welcome (if viewed with some suspicion) in both camps. My favourite track was “Mt. Vernon – Gateway To Nowhere”, a humourously scathing dismissal of my hometown, the “All-American town” where you can get “literally every size and colour of white socks,” where garbage trucks “make deliveries once a week” and whose citizenry opposed adding fluoride to the city’s water supply because of reputed links to both “Mongoloid births and that most dreaded disease, Chinese Communism.” As a 10-year-old, I could quote large chunks of the routine for the amusement of friends and relatives. I don’t know too much about the cast, though I see lead Murray Horwitz has gone to rather good things. 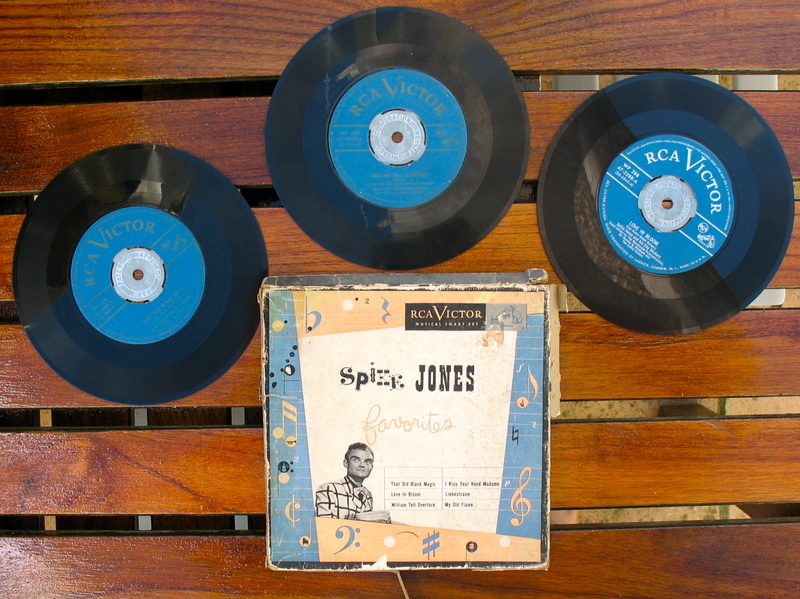 There have been many things I’ve appropriated from my family home over the years, but one of my favourites and certainly one of the longest lived is my Spike Jones 3 x 7″ box set (see below). I say “my” because I’ve felt a sense of proprietorship over it since I was seven or eight and it certainly has lived in my collection since around that time (possession being nine-tenths of the law), though strictly speaking it was and remains my father’s. 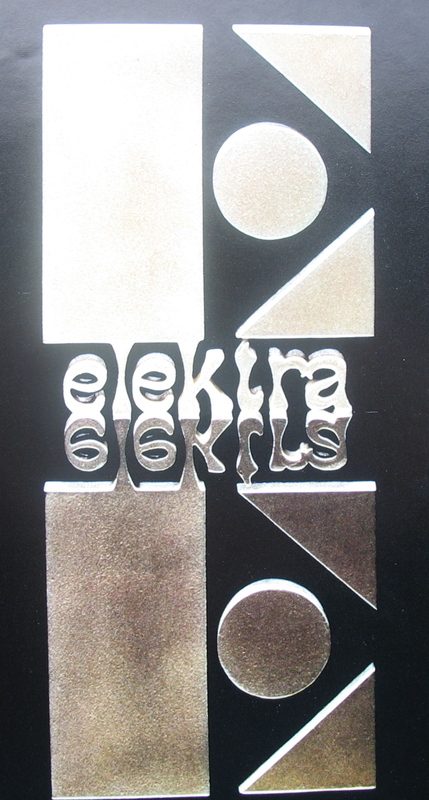 Interestingly, Jones represents a specific, though obscure area of musical overlap between me and Thrifty Vinyl’s own esteemed Ekolad. What sets Jones and his City Slickers apart from other artists (and in common with other geniuses, e.g. Picasso, Miles Davis and the entire 1940s-1950s Warner Brother Loony Tunes production teams) is an absolute mastery of form and a compulsion to challenge form. 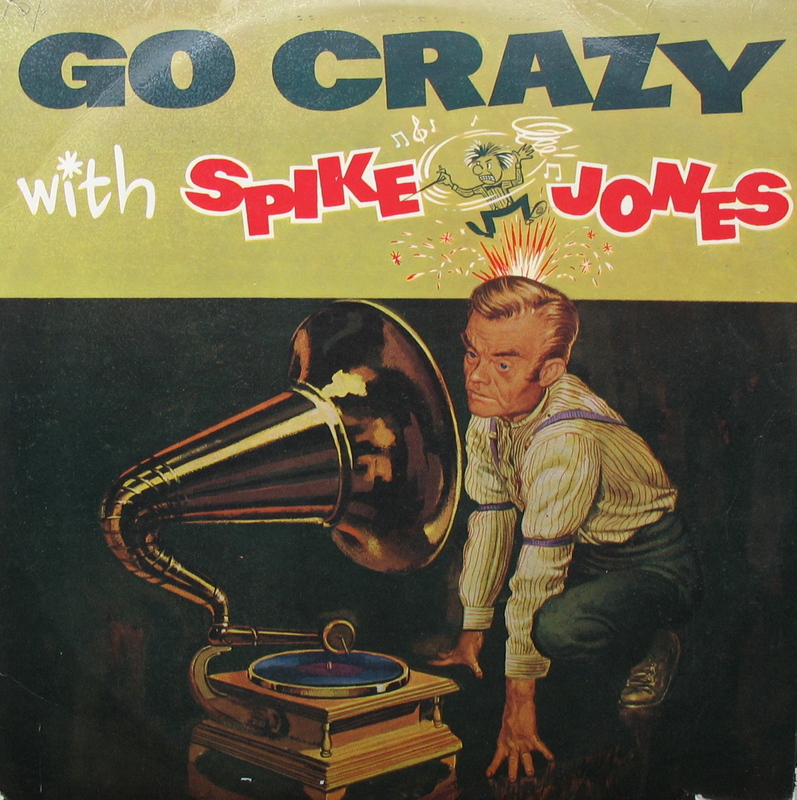 The performances on Go Crazy (credited to Spike Jones and the Band That Plays For Fun) are 1960 recreations of some earlier glories and feature many of the same bike horns, tin pans, .22 Smith & Wesson revolvers and sneezes as before with added bluesy piano flourishes and latter-day cultural references. There’s even a “Tequila” pastiche called “Pimples and Braces”. 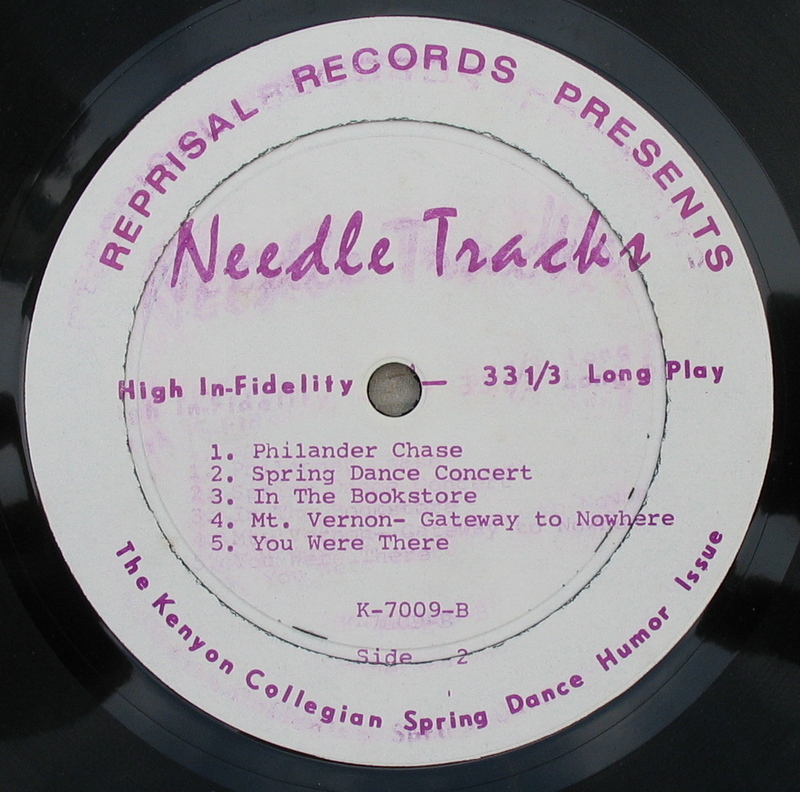 However, there’s something dated and less anarchic about this particular collection (as compared to my singles compilation, music which dates from the 1940s), for Jones tried to shoehorn his earlier style into a culture that has moved on; unlike, Picasso, et al., drummer and bandleader Jones was still mining the same vein. Topical comedy is the only thing in the world of aural excitement to date faster than a drum sound, so these mild satires on 1960s celebrity/political culture and the Nixon White House respectively exist less as funny stuff than historical documents. While the main players sound uncannily accurate, who apart from (American) adults who lived through the decade remember David Susskind, Georgie Jessel, Dean Rusk, Everett Dirksen, Joey Bishop, et. al, let alone appreciates obscure allusions now lost in the fug of that turbulent time. 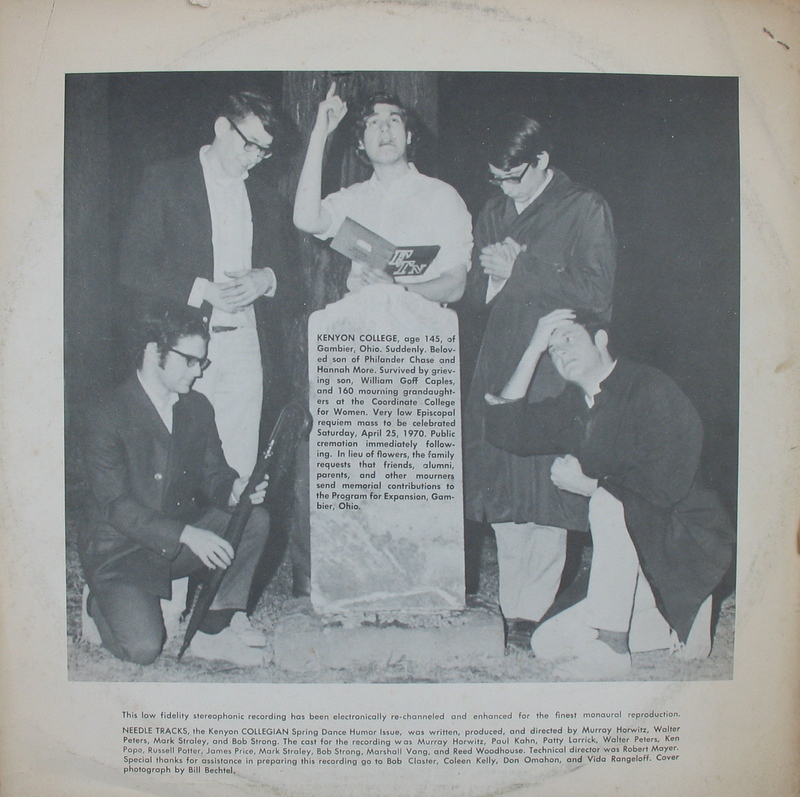 Now I happen to know a little something of these people and events, but only vicariously through the voracious reading in the decades immediately following of 1960s Mad magazines. As it happens, Mad caricaturist Mort Drucker (wotta name!) 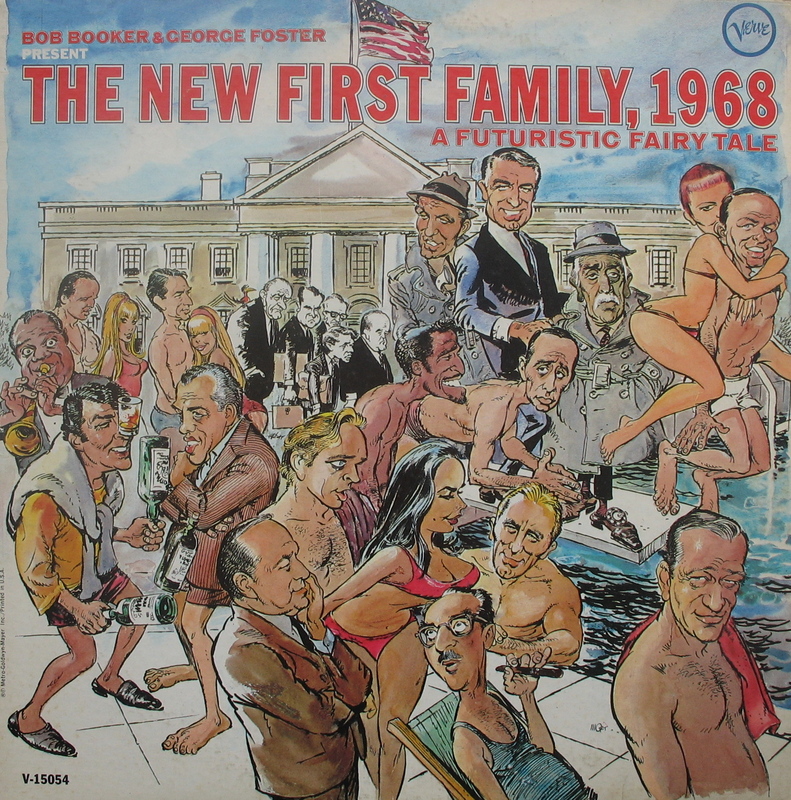 supplied the cover art for the The New First Family, 1968 Lp. New Yorker cartoonist Edward Sorel illustrated the I Am The President sleeve. 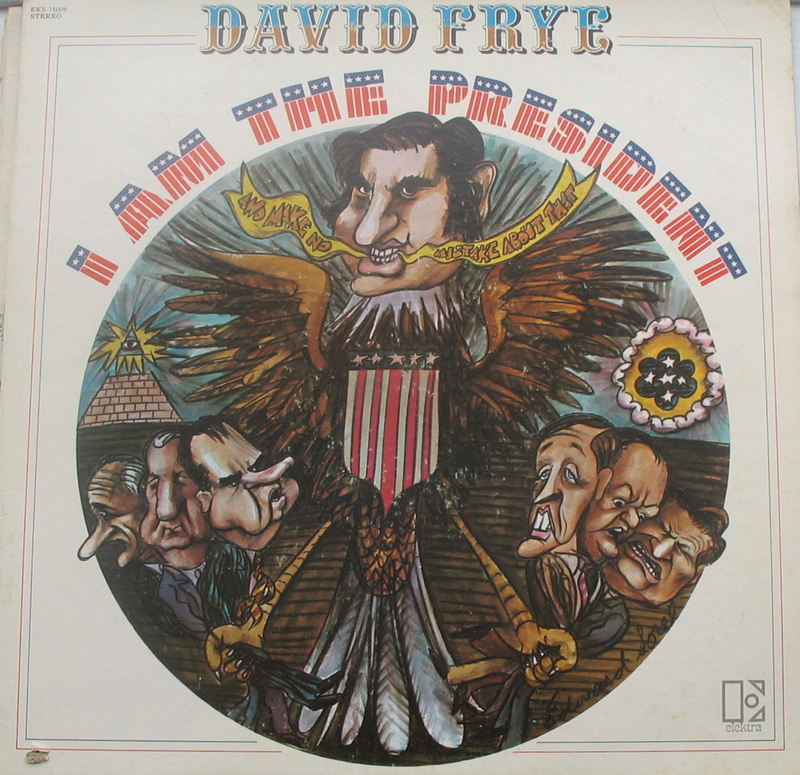 Most of the characters for both records were voiced by David Frye who did several other political comedy (mainly Nixon) records and who, co-incidentally, died just a month a half ago. So now we won’t have him to kick around anymore, either. 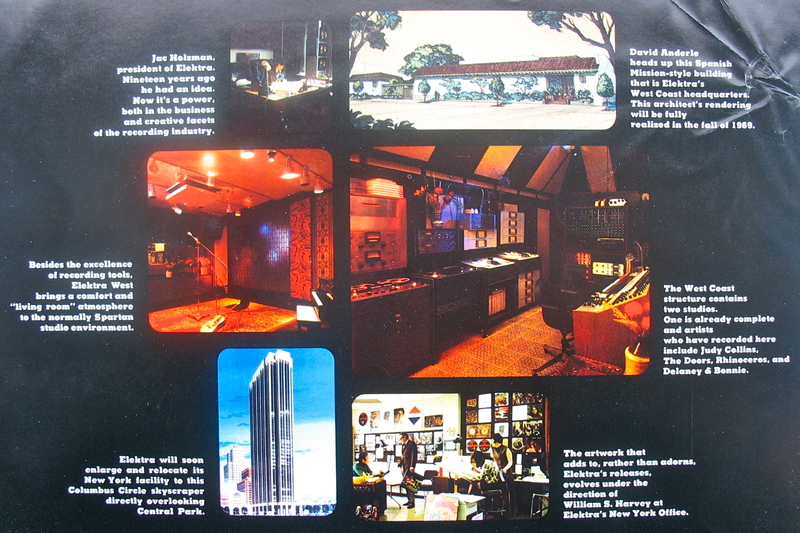 These images were on the inner sleeve of President and show off Elektra’s new-found, Doors-funded wealth in four-colour glory.